A Long March rocket blasted off with a Chinese reconnaissance satellite Tuesday on an unannounced mission to collect imagery of strategic sites around the world. The Yaogan 13 remote sensing satellite took off at 1850 GMT (1:50 p.m. EST) Tuesday from the Taiyuan launching base in Shanxi province of northern China. Launch occurred at 2:50 a.m. Wednesday Beijing time. The two-stage Long March 2C rocket placed the payload in a sun-synchronous orbit with an average altitude of about 300 miles, according to satellite tracking data. 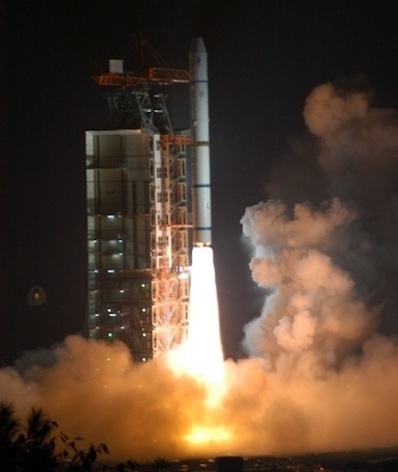 The launch was successful, according to the the China Academy of Launch Vehicle Technology. The Yaogan series of satellites gather optical and radar reconnaissance imagery for Chinese military and intelligence agencies. Yaogan 13 may carry a synthetic aperture radar sensor to peer through clouds for all-weather, night-and-day image collection. Chinese officials have not divulged details of the Yaogan 13 satellite. The launch was the first flight of a Long March 2C booster since Aug. 18, when an identical rocket failed to orbit an experimental Shijian missile warning satellite. Engineers concluded the second stage control system was to blame for the August launch failure. Tuesday's Long March flight was the 15th successful space launch of the year for China, tying a record for Chinese launch activity set last year. It was the 72nd space launch worldwide to reach orbit in 2011.